Beds at the only county-run sober center in San Francisco, which offers inebriated individuals who might otherwise end up in the emergency room a place to sober up. Alcohol abuse-related ER rates in District 9, which includes the Mission, are higher than almost every other district. Photo by Annette Choi. The Mission has an alcohol problem. Of San Francisco’s 11 supervisory districts, District 9 — which covers the Mission and Portola — sends more people to the emergency room for alcohol abuse than almost every other district. Rising rates of homelessness and the large number of liquor stores in the area may be why. The city’s only sobering center is one way to manage the problem, but experts say longer-term solutions are needed, now. The district’s high alcohol abuse rates don’t necessarily mean there are more inebriated people in the area, said Judith Martin, medical director of Substance Abuse Services with the San Francisco Department of Public Health. But they do mean the abuse is more visible here. The homeless population in District 9 rose more than 40 percent from 2015 to 2017, according to the San Francisco Department of Homelessness and Supportive Housing. This month, the city’s Department of Public Health counted 376 homeless individuals in the Mission. It’s the third-highest count in the supervisory districts—after District 6, which includes South of Market and the Tenderloin, and District 10, which includes Bayview. Almost 40 percent of those individuals are likely to be dependent on alcohol, according to national estimates by the National Coalition for the Homeless. And the Mission does an exceptional job of catering to that dependence. A health department survey from last year found that the Mission has more off-sale alcohol outlet permits—which authorize liquor, grocery and convenience stores to sell alcohol in sealed containers—than any other neighborhood in the city. The Mission has 90 permits; runner-up is Bernal Heights, which has 20. “It’s easy access,” said Megan Kennel, Medical Respite and Sobering Center’s charge nurse. A 2016 Community Health Assessment Report by the health department also found that neighborhoods with higher rates of off-sale alcohol outlets also have high rates of hospitalizations and emergency room visits due to alcohol. In part, that’s because public consumption of substances, including alcohol, attracts police and emergency services attention, said Martin. When San Francisco Police Department officers encounter an overly inebriated individual on the street, they typically call an ambulance—especially if they notice serious bodily injuries. But costly emergency care services are not always necessary for inebriated individuals, Martin said. “All some people need is a safe space to sleep it off,” she said. The police department is one option. SFPD officers will sometimes take an inebriated person to the nearest station to sober up. The visits generally last four hours and have no criminal repercussions. Another option is a sobering center — a facility that offers safe, short-term care for publicly intoxicated individuals until they become sober. It’s a cheaper alternative to the emergency room, and can offer more services, and longer stays, than the police department. Cities across the country, from Anchorage, Alaska to Danbury, Connecticut, have adopted them. 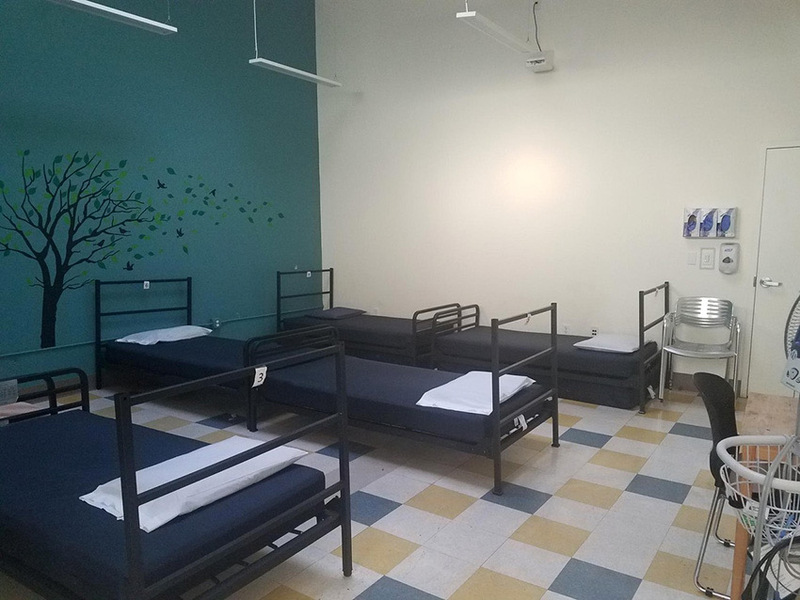 San Francisco’s Medical Respite and Sobering Center, on Mission and Eighth Street, is a nurse-managed, 24-hour facility with twelve beds, showers, detox services, and access to social workers. “We help with the ER backlog,” said Kennel. The center, opened in 2002 by the health department and non-profit organization Community Awareness and Treatment Services, is the only county-run sobering center in San Francisco. More than 80 percent of the center’s clients are homeless. And anyone who checks in is welcome to stay for 24 hours. “We’re usually full by midnight,” Kennel said. Sobering centers are short-term solutions by design. They don’t help those with chronic alcohol abuse, including those with mental health disorders who turn to alcohol to cope, said Dr. Malini Singh, vice chief of Emergency Medicine at the Zuckerberg San Francisco General Hospital. For people in need of a longer-term solution, the sobering center points the way to programs like the Joe Healy Medical Detoxification, located in Hayes Valley. During the three-week program, the clients are fed nutritious meals and put on a regimen of prescription drugs to manage their detox symptoms. “I speak with the Sobering Center just about every morning to see if they have anyone they wish to refer to us,” said intake coordinator Pam Hunter.